Under this African sky littered with stars, I’m fighting off mosquitoes while journaling to the flicker of a citronella candle. We’ve just set up camp for the night, pitching our tent on the roof of our car. Two massive t-bone steaks sit beside me on a smoky braai (bbq) while our puny fire attempts to ward off the cacophony of sounds that surround. Hippos snorting, elephants trumpeting and lions roaring intermittently in the distance, it is the raw, rugged Africa we dreamed of. 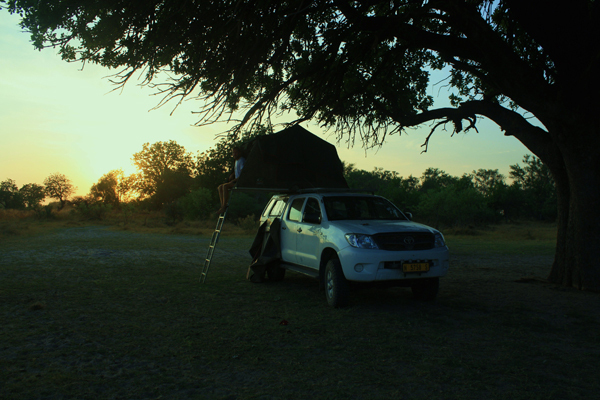 Deep in the African bush of Botswana, we realized we’d made it. It didn’t take long for us to realize Moremi Game Reserve is a special place and quite unlike any wildlife park in the world. Encompassing 5,000 square kilometers in northern Botswana, it’s part of the inland river delta expanse known as the Okavango Delta. 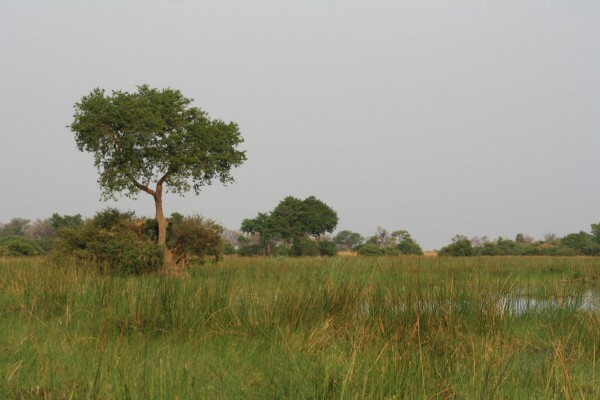 In stark contrast to the thorny forests and desert-like terrain of many of Africa’s great game parks, the Okavango Delta consists of a network of streams and marshland sustaining vast quantities of wildlife. 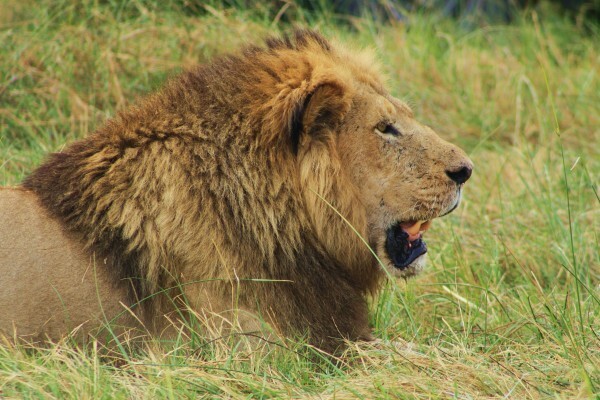 The Moremi Game Reserve, however, is the only part of the Delta officially sectioned off for wildlife preservation, creating a flourishing oasis with the highest density of wildlife in all of Botswana. Aside from mass quantities of animals here, the exclusivity of the park helps add to its appeal. 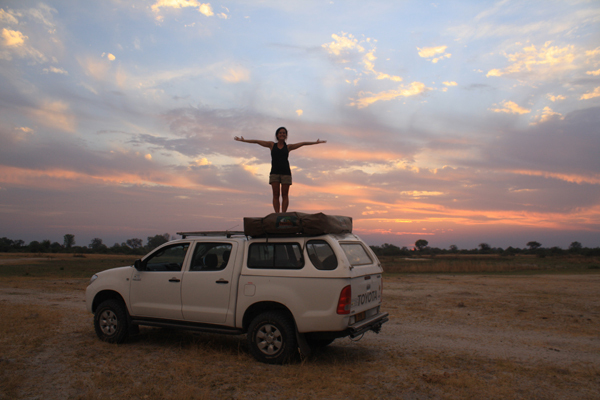 Accommodation is limited to those willing to fork out up to $1,000 a night for the handful of high-end luxury lodges or those experienced or brave enough to embark on a solo-4WD bush-camping expedition. This means absent in Moremi are those massive tour groups traipsing around the continent and crowds of people looking for their taste of the bush. Experienced we were not, but armed with a, now reliable (story on this saga coming soon), 4WD vehicle, lots of guts and maybe a naïve sense of confidence, to Moremi we were bound. There was a lot we couldn’t be prepared enough for. First off were the roads. We’d just wrapped up two weeks of bush adventures in Namibia where there was lots of talk about how nice and smooth the roads were. We didn’t know where the hell this reputation had come from as they were quite possibly the worst and most dangerous roads we’d ever seen. There we’d been the first to arrive to the scene of a fatal accident and had several close encounters ourselves. 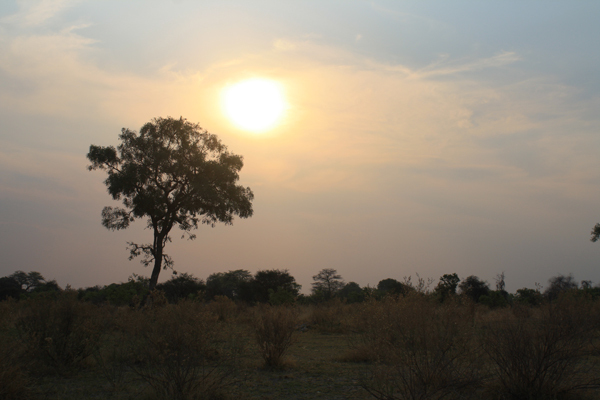 Once we arrived to Moremi, however, we got it. Roads here hardly exist. Tracks in the reserve are made of clay and sand. And boy is it ever thick. Like a Zamboni machine floating over ice, you’re not really driving, but just steering as you hover over the sand, weaving around windy paths of the forest. The deep sand roads are reason enough to require a 4WD vehicle to enter the park, and then there is the water. Driving through the Delta meant we often came across marshland where water stood in our tracks. And it wasn’t just puddles of water we encountered. In some cases it was more like a river – waist-high. We had no choice but to test our wheels in the croc and hippo-infested water while crossing fingers we didn’t get trapped in the clay floor bed. These were some trying moments, no doubt, but without them it wouldn’t have been the experience it was: the raw, rugged Africa we came for. Now that I’ve painted a bit of a picture of the challenging conditions of the park, let me tell you about the beauty. We arrived to our campsite mid-afternoon to begin our three days in the park. We were staying at Third Bridge Campsite, named after the third log bridge you pass from the South Gate entrance. 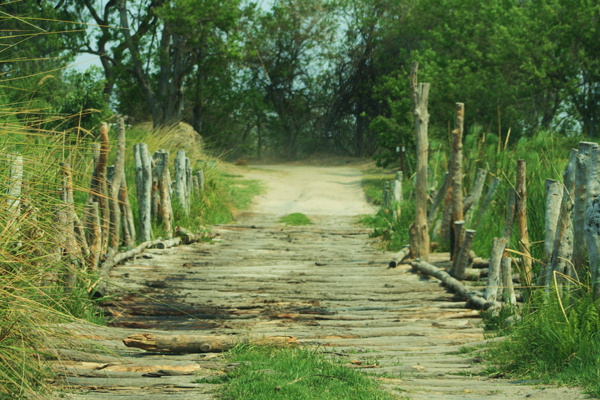 Rustic would be an overstatement for the condition of the bridge over the idyllic Sekiri River, but picturesque would be an understatement for our locale. The campsite consisted of 10 isolated plots of land interspersed in the forest equipped with no more than a small stone slab on which to build a fire. Ours was number 10, way off in the distance in the most isolated section of camp. Upon checking into our campsite, a hard-headed Batswana woman gave us a reality check on our surroundings: always be armed with a strong flashlight, build a big fire and don’t get out of your tent for any reason in the middle of the night. Midnight bathroom breaks are strongly discouraged and in an emergency we were to go together, right next to our vehicle and be on a guard for hyenas and big cats lurking. Confirming we were, in fact, flirting with a bit of danger way out here in the bush, Ryan declared this was the best check-in rundown we’d ever gotten. Before concluding our check, the woman added, “Oh by the way, there was a kill today just up the road.” Within seconds we were off weaving down the sand roads and over dilapidated bridges to get a glimpse at our first kill and first real taste of Moremi. 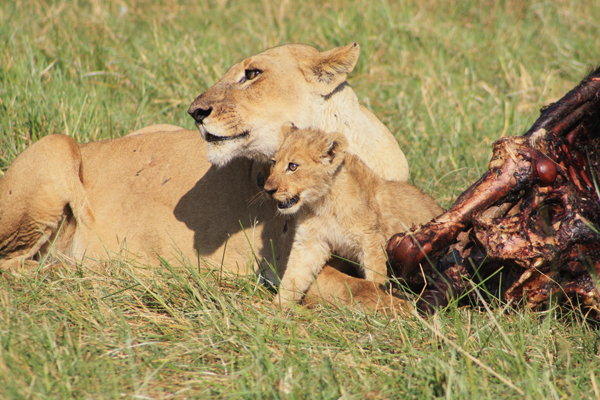 No more than 15 minutes away from where we were sleeping, we came across a male and female lion feasting on an enormous buffalo. It was just the two of us in the wild with two lions just feet away. We could hear their roaring purr and the crushing sounds of their jaw breaking the buffalo’s bones as well as the heavy, almost exaggerated, panting from the day’s work. Out there on our own with no one else around but the king of the forest with his lady and cub, we could hardly believe our eyes. This was the first of many spectacular wildlife moments in Moremi Game Reserve. We spent the next three days jaws dropped in complete awe of all that was around us. 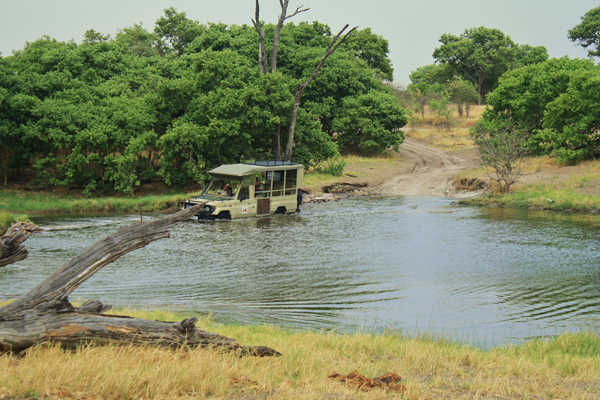 Morning and afternoon game drives brought us to all corners of the park. We watched giraffes graze on branches of trees where monkeys gathered with their young. In the shallows of rustling reed beds, we witnessed a ballet staring every hoofed mammal on the planet. 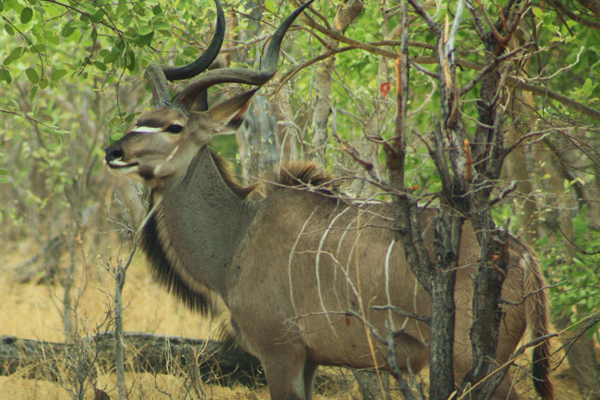 There were kudus, impalas, gemsbock and springbok galore. 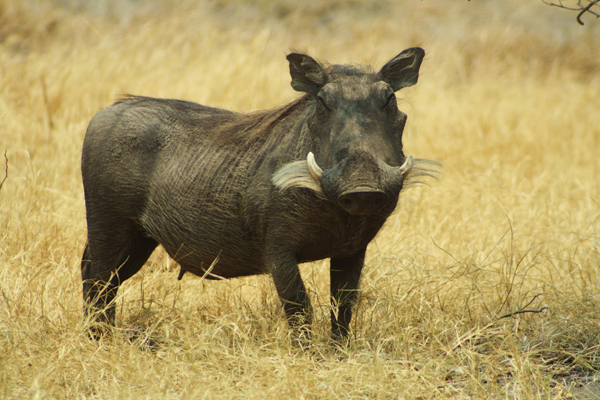 Wildebeest, jackals and the ever-comical warthogs were plentiful and even a momma rhino and her baby made a debut. And splashing hippos were sure to make their presence known , with one trampling through our campsite one night amidst his thunderous snorts. Hurrying back to camp each night after our sunset drives, we raced to beat the falling sun so we could set up camp in the comfort of the last light of day. One night we didn’t quite make it. But this was for good reason. On our way back to Third Bridge, we experienced, quite possibly, the most beautiful moment of our trip. Driving into the unrivaled African sunset the sky was adorned in a symphony of colors as we drove directly into a herd of 40 elephants. At first startled by their mass presence, we started to veer our car elsewhere. We’d been taught to be on guard as the African elephant can be extremely aggressive, in some cases actually chasing down cars and tipping them over to protect their young. But this incident would be different. 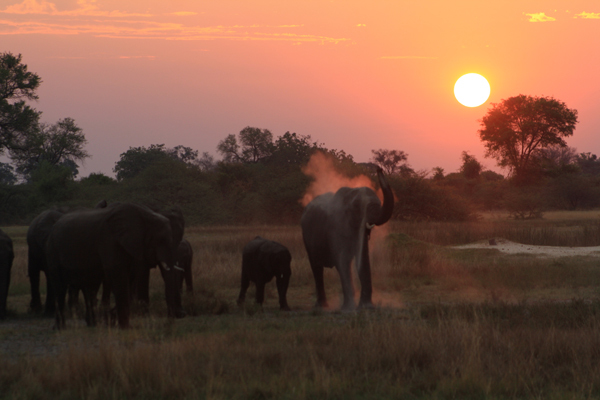 The approaching herd was nothing short of peaceful, graceful and magnificent, throwing the earth’s red dust into the air amidst the sinking hot sun. Now out on the top of our car, we looked at each other in pure amazement and were reminded again why we travel. Kudos for sharing this! 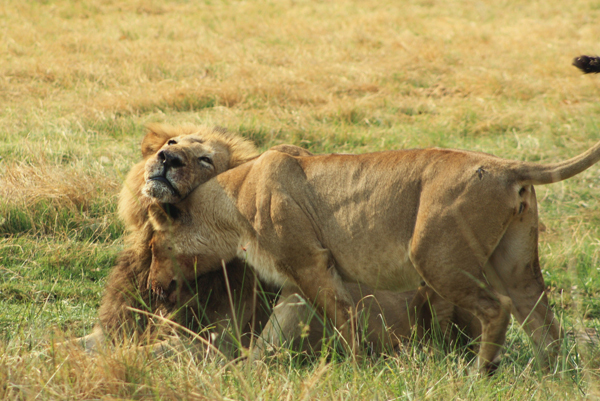 You can definitely enjoy a great safari experience at Moremi. I will definitely put it in my checklist of places to go. @Jodi – you’ll get there if you want to. Thanks for reading. Looks like you’ve got a lot of adventure in front of you. Have a blast! I’m dying to visit Africa. Brilliant post! Jodi´s last [type] ..Singapore, I’m Charmed to Meet You!